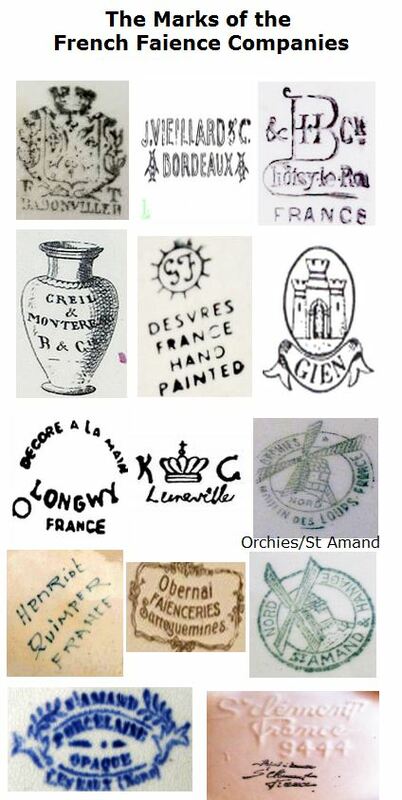 Here are the two main things to remember about the vintage and antique pottery marks of France (we have discovered most of this stuff thanks to our China Chat posts - scroll to bottom of the page to browse them). 1. Sevres, established in 1756, was a factory located in south west Paris, enjoying royal patronage and a monopoly, which used a detailed system of markings from the outset. 2. Limoges is an area in the middle of France about 200 miles south of Paris, not a factory. It is a region rich in mineral deposits suitable for making high quality porcelain. 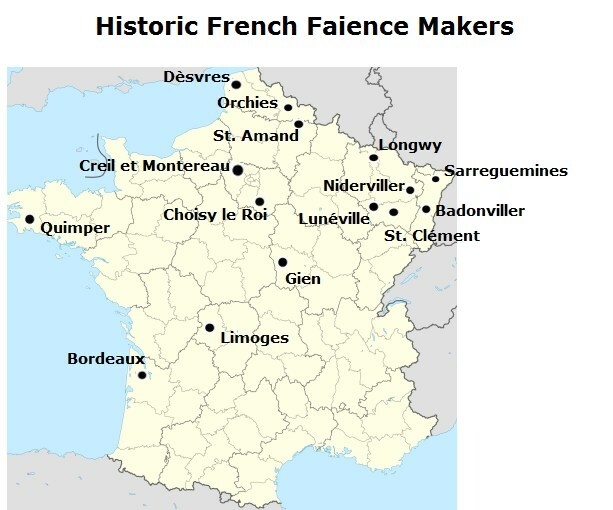 Many factories were set up in this region, all being classified as 'Limoges'. 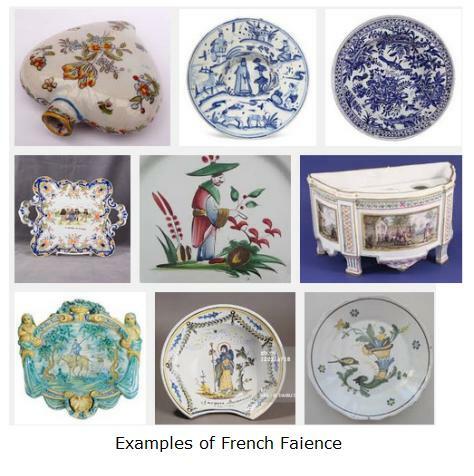 French faience came into being in 1689 when King Louis XIV needed money, so taxed tableware made of gold and silver. A new breed of French entrepreneur quickly began to make copies of brightly decorated Italian earthenware perfected by the makers of Faenza. Before the discovery of the Limoges deposits the making of true porcelain was not really possible on any scale in France. French porcelain began at a place called Saint-Cloud around 1695. They weren't making true porcelain at that time, just a softer glassier version made from a mixture of clay, chalk, sand and flux. This paste was difficult to work with, broke easily and was impossible to make larger items with. Yet the resulting work could be exquisite. By 1710, the Germans had discovered the secret of how the Chinese made porcelain using china clay and china rock (feldspar). The French didn't take long to follow. Once the German secret had filtered out through an early example of industrial espionage, the French were on the hunt for white gold about a quarter of a century later. What were the early French antique pottery marks? The correct recipe for true porcelain took some time to become public knowledge (1735). This prompted a group of Frenchmen to found a porcelain factory at Vincennes, east of Paris, with the express purpose of emulating the German Meissen work. 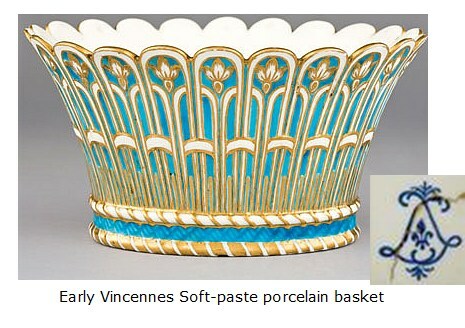 So in the town of Vincennes in 1740, the French tried to begin to understand how to make true porcelain. Detailed and systematic antique pottery marks of France were begun at Vincennes, in 1753. This was about the time that the factory won Royal patronage and a monopoly on all decorated porcelain wares. 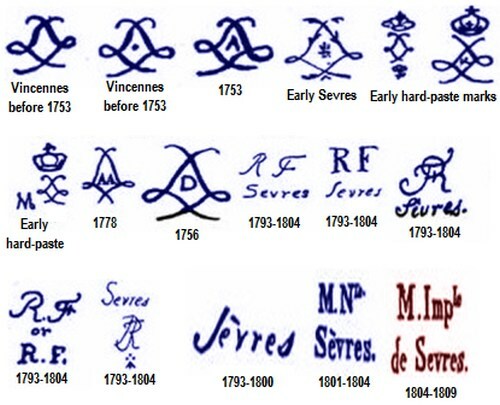 Below is a small selection if authenticated Vincennes/Sevres marks. There was all-round excitement at the exquisite wares and technical genius of the soft-paste art ceramics. By 1756 the works had been moved to a south western suburb of Paris called Sevres, close to the royal palace of Versailles. 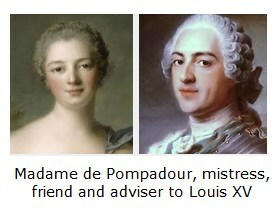 With failing finances, the King bought the factory outright in 1759. By 1771 the rich deposits of Limoges had prompted the building of porcelain manufacturing plants for fine porcelain production. The important time for Limoges in terms of quality was from 1771 to the 1930's. After that, changes in tastes and economic circumstances meant Limoges produce became less high art and more functional in character. Limoges antique pottery marks will be put on underneath the glaze onto the china body. These whiteware marks denote that the piece was decorated after the mark was added. Therefore, by logical conclusion, marks placed on over the top of the glaze were placed there by the retailer, importer or decorator. After 1891 imported goods to the US and UK had to have country of origin. This may suggest items without the work 'France' might be either for the domestic consumption of made prior to 1891. In 1689 King Louis XIV needed money, so decided to tax people who possessed silver and gold tableware. Needless to say, the popularity of earthenware increases almost overnight in France. The French notice that the region of Faenza in Italy has mastered the art of earthenware ceramics, so seeks to do the same. Calling the new industry after the Italian city - French 'faience' is born. Limoges Peint Main mark G? Single Initial Script "M" Pottery Mark on Art Nouveau Vase? To return to the page list on the main pottery marks page, please click here (if you wait a few moments for the page to load it will auto-scroll down to the archive page list).